After a few weeks in the country, "Chuchaqui" quickly became one of my favorite words of Ecuadorian slang. The sounds just roles off your tongue easier than most Spanish when you're shuffling through the jumble of foreign phrases in your hungover mind - "choo-chaa-keyy." While it may simply translate to "hangover," its absence in my pocket dictionary led me to imagine a definition so much more meaningful than a typical hangover. A hangover is what you have in The States where you spend all day Sunday under blankets in your air conditioned apartment. You're watching HBO On Demand with your best friends. Maybe you take a hot shower while your roommate orders Chinese food with extra fortune cookies. Living in a small surf town on the coast of Ecuador, chuchaqui became synonymous with encebollado. Waking up to Salsa music blasting through the thin bamboo walls of the neighbor's house, before my head would start to ache, I would walk barefoot to any small cabaña on the beach for an encebollado. After agreeing with the large señora behind the counter on a $2 price, she quickly brings out a steaming bowl of fish stew and tosses a small bag of chifles on the table. I crush the plantain chips while they're still in the bag and then dump the yellow pieces on top of the soup. I ask for extra lime to squeeze over the concoction of mystery fish, yucca, onions and a big pile of cilantro. It has all become so routine. A routine just like my Saturday night. I wish I could remember the time when I stopped feeling like a silly gringa tourist and started making this place my home. When I learned to fake like I could dance salsa, stopped fumbling over my newly learned Spanish and let go.. maybe let the alcohol do the talking. I assume the transition occurred when I found myself once again sitting on the concrete wall across from Flay-o-lay, the beach cabaña with the loudest speakers. It blasted away the other cabaña competitors, so it was the obvious choice for nightlife. We were far enough away from the bar so we could drink our store-bought rum and coke mixtures, but still hear the pounding reggaeton and watch the dancing. The group of local surfer boys laughed and demonstrated their salsa moves while we passed around cups and too many shots of caña. A few stood in the alley next to us under the shadows of yellow light while dipping keys into plastic bags. Occasionally we would pair-off to go dance but return right back to our spot on the concrete. When the music stopped, someone draped his arm over my shoulder. My small, grey-eyed Equadorian friend, Christian, kept reminding me that he was "casado pero no capado." The phrase directly translates to "married but not castrated" and continuously made the group smirk and release drunken giggles. Skinny, stray dogs trailed our footsteps as we walked the dark streets to buy beer. $1.25 for a 19.5 oz. Pilsner - if we promised to return the empty bottles in the morning. We climbed up to an all-familiar roof, sat on the edge and took turns taking swigs of beer. We laughed and listened to boy after boy tell an exaggerated story until the sun rose over our backs to find its reflection in the ocean. Eventually the roosters crowed, literally, and the streets came to life. Families opened the doors to the small tiendas in front of their concrete homes. Women washed laundry in big bins outside. Dark, barefoot children wrestled in the dirt roads. Some of the boys left the rooftop to grab their boards for a quick surf before the tide went down. I stumbled home while hoping not to encounter any of my student's parents. I gave a "buenos dias" to my neighbors playing cards out front, opened my door, ducked under the hammock and made my way to my bed. 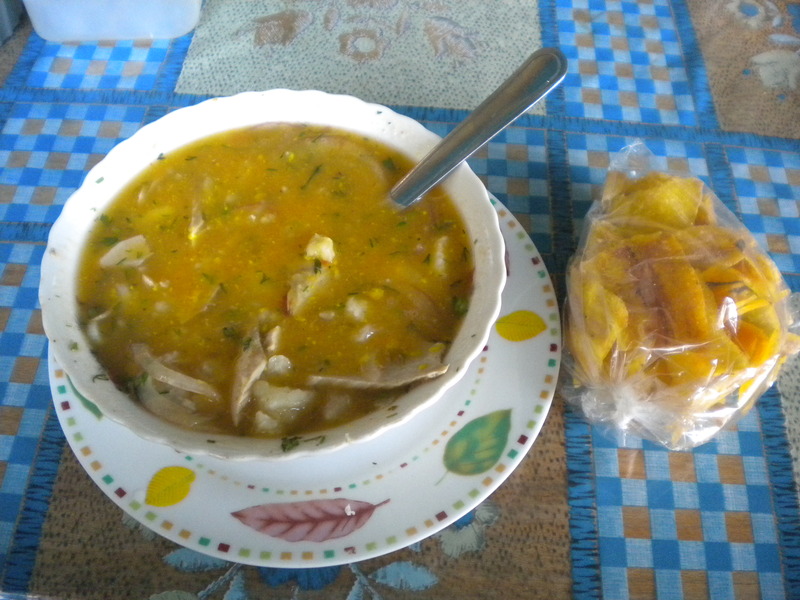 I crawled under the mosquito net and slept until I woke up to embrace the chuchaqui with a bowl of fish stew.